Some may differ. But I believe the government of Bangladesh is currently not seeing beyond Chinese Economic Inducements and some temporary political leverages in the region. It is important to consider all aspects especially when an action could endanger thousands of human lives and is bad for a country's long-term national interests. Somebody, please deliver these points to the Bangladesh government and policy makers. Bangladesh and Myanmar have made a bilateral agreement on Rohingya repatriation (which is due to begin soon). However, the survivors/refugees themselves, all alike, say "we prefer deaths over being forcibly sent back to Myanmar. We will at least get funerals here after deaths. Over there, the cruel Myanmar do not treat us like humans and commit all sort of atrocities." Some refugees have even said that they would commit suicide if foced to go back to the 'Killing Fields in Myanmar'. The UN Human Rights Council have proven that Genocide on the Rohingya people is still going on in Myanmar. Under such condition, (possible) forced repatriation of Rohingya by the Bangladesh government and other parties (involved in the process) are violating the act of Non-refoulement and facilitating Myanmar's Genocide (on Rohingya). On Monday (Nov 12), Camp-in-Charge (CiC) of Balukhali camp 9 and 10 in Cox's Bazaar summoned all Mazhis (Captains or Focal Points) and Elders from the camps and threatened them to persuade 2,260 Survivors enlisted for repatriation scheduled on November 15. If failed, they were told, the Bangladesh authorities will cease Ration Supply to the refugees, bar the refugee youths from working in NGOs/INGOs, restrict their movements and stop local shopkeepers/vendors from selling foods and goods to them, implying that the survivors/refugees will be kept starved. 'Go back or die here out of starvation in a confined place.' Just like that? What is so big a crime the survivors have committed by seeking refuge in the country that they deserve to be starved and confined (to death)? Coming back to the point, the Myanmar government has explicitly shown its intention that the returning refugee will be confined in internment camps or a very small place of housing arrangement fenced with barbed wire. 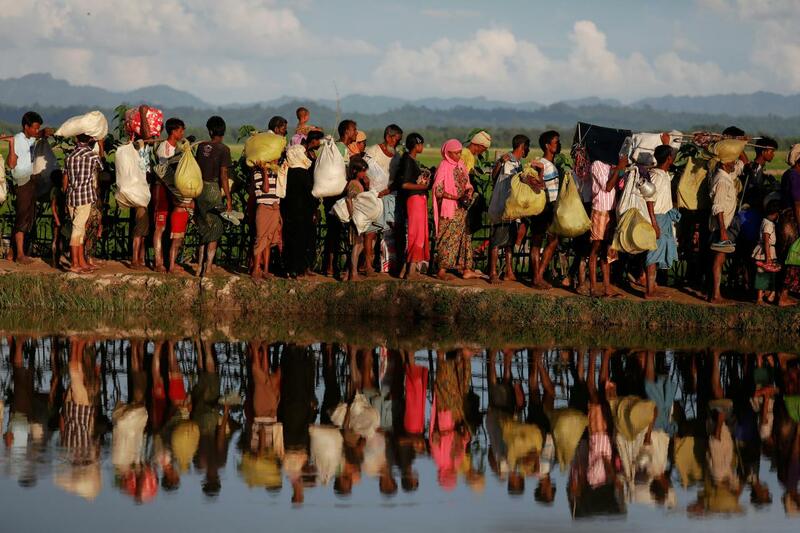 There will be no freedom to move around for Rohingya. Genocide and atrocity crimes against them will continue silently. In turn, that will force the people to flee from the internment camps one by one and silently to Bangladesh. And these people will successfully be assimilating in Bangladesh societies, like it's been going on for decades. Everyone is aware of that. Bangladesh won't be able to stop that gradual migration by the Rohingya (because of Genocide) into the country. Consequently, in Myanmar, the population of Rohingya decrease and increase in Bangladesh over the time. Who gains and who loses at the end? It's all clear. Therefore, we request the government and people of Bangladesh to 'Make Hay While the Sun is Shining' and not miss this historical opportunity which will not only serve Bangladesh's long term national interest but also end Genocide and shape Rohingya's future. Please be an important part in ending the Genocide going on more than 40 years. Please help them get justice and International Protection to ensure Genocide (on them) never happens again. Dear Bangladesh's Government, please see beyond Chinese economic inducements; and bilateral economic and trade ties with Myanmar. Please reconsider your position on the premature repatriation of the Rohingya which will further endanger them. The solidarity of World Citizens are with Rohingya. Thus, if you cooperate with Rohingya and the governments of many countries that are in Solidarity with Rohingya, you could find a way out of Chinese pressures as well, if there are any. These people are not threats to Bangladesh but will really benefit the country provided the opportunities. They are not threats to Myanmar sovereignty, either. They are threat to none. Perhaps, their oppressor (Myanmar genocidal regime) perceives them to be threats because they are committing Genocide (on them), just like a burgalar percieves the (house) owner a threat. All they want to dream and live like other human beings, like you, like them, like all. Please help them dream and live as equally as other human beings. Yes, they are human beings, too, and human lives are more precious than anything else.